I followed one of the links through to Amazon’s Adult Toys and Games section (coy name for not so coy product section). In amongst the variably shaped pink and purple vibrators I came across this picture. My initial reaction was along the lines of WTF…how do you use this? 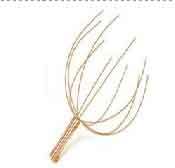 A closer look at the caption showed that it is a head massager; just with a classification of personal massage it got displayed on a rather different page..